Are you a restaurant of bar owner? Create a better customer experience with our digital menus. Your guests can easily see your dishes and order things they like within a couple of clicks and straight from their smartphone. You can make dishes really come to live by using photos, videos and clear product descriptions. Smart cross and up sell functionality will help you increase the average order value. The design of the menu is easily adaptable to your flavor and will fit with your restaurant of bar concept. You can even do more than uploading photos, videos and product descriptions of your dishes. For example, show where your products are from or tell your customers how you prepare a particular dish. This will give the extra experience your customers are looking for. Other functionalities such as things to see in the area of a bit or history about your restaurant or bar will add up to that experience. Our digital menu works fully on the smartphone of your guests. No installation by the customer is required. Your guest can enter the digital menu in two ways. By logging in into your Wifi network, your guests will automatically end up in the digital menu. This is called a “captive portal” and very often used in hotels but perfectly suitable for the food service industry too. 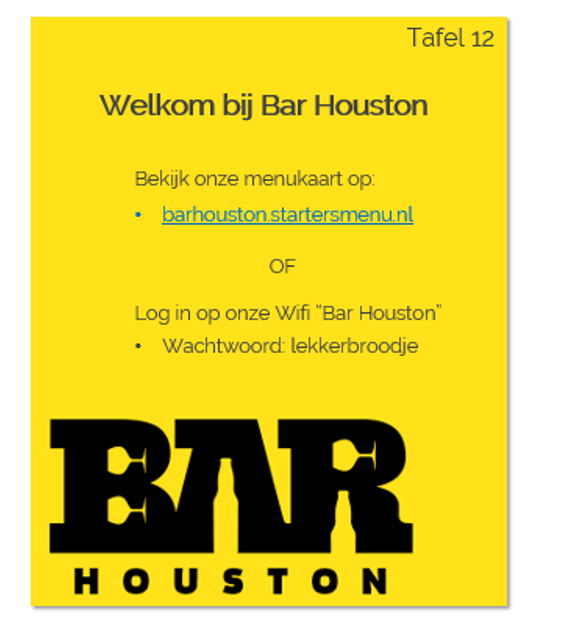 Every restaurant of bar gets a unique website link e.g. YOURPLACE.startermenu.com. By designing a nice little card and by putting it on the table, you can explain your guests how to find the digital menu. Tip: Put your Wifi details on the card too. They will like free internet! Our system doesn’t need any integration with your current checkout systems and can be easily installed in just a couple of clicks. 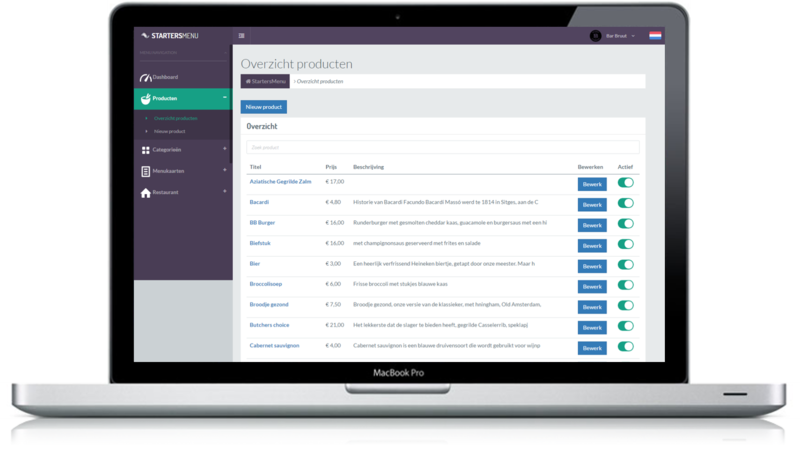 You can manage the digital menu easily through our admin system. Adding, editing or deleting menus and dishes is done in a matter of a couple of clicks. With our system you can assign different roles to different users. E.g. a waiter has different access rights and available functionalities than somebody in the kitchen. We have different monthly subscriptions on our services based on the chosen functionalities. You can cancel our services every month and without any additional costs. Check out our pricing or contact us.